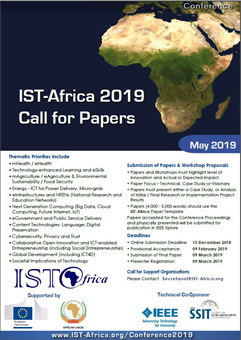 Paper submissions are invited for IST-Africa 2019. The conference language is English and submissions should be for technical or visionary papers, and business or government case studies within the scope of the conference. Papers (4,000 - 5,000 words) using the IST-Africa Template must be registered on the conference portal by the extended deadline of 21 December 2018. Please refer to Paper Guidelines for more information. It is a condition of submitting a paper that (a) authors act on feedback and comments provided by the International Programme Committee (IPC) to ensure high quality conference proceedings, (b) presenters act on feedback provided by their Session Chair to ensure high quality presentations, and (c) presenters register and pay the participant's fee by 09 March 2018, before the publication of the Final Programme. While authors are welcome to submit papers on behalf of co-authors at the review stage to facilitate submission, please note that subject to acceptance for inclusion in the Programme it will then be necessary to indicate a unique presenter for each paper, who is not already in the Programme. Each presenter can present one paper in the Programme. It is necessary for papers to be physically presented during the event to ensure inclusion in the Proceedings.